Is the abominable snowman out there? Josh Gates aims to answer that question in his new Expedition Unknown: Hunt for the Yeti TV show, premiering Wednesday, October 5, 2016 at 9:00pm ET/PT on Travel Channel. In the upcoming four episode docu-series, Gates will travel through Nepal and Bhutan, in search of the truth behind the Yeti legend. Watch a teaser and get the skinny from Travel channel. NEW YORK (August 25, 2016) – Long before Bigfoot was a household name, there was Yeti – the so-called abominable snowman and legendary towering creature believed to roam the snow-capped peaks of the Himalayas. For centuries, eyewitnesses have claimed run-ins with the infamous beast. But without conclusive evidence, the question remains: is the Yeti fact or folklore? 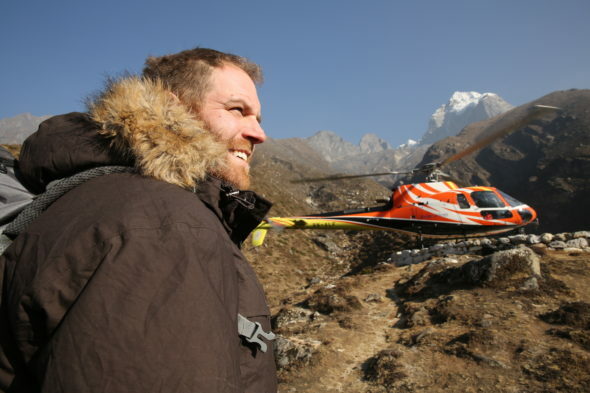 In Travel Channel’s four-week special event,“Expedition Unknown: Hunt for the Yeti” beginning Wednesday, October 5 at 9:00 p.m. ET/PT, adventurer and explorer Josh Gates embarks on an epic and enthralling journey through Nepal and Bhutan, in search of the truth behind the legend. Is the abominable snowman out there? And if so, what is it? Relying on his wit, instinct, expert negotiation tactics and the latest stealth photo and video gadgets, Gates embarks on a high-altitude quest for evidence across the Himalayas. From the hidden caves of Nepal’s backcountry and the iconic slopes of Everest base camp to Bhutan’s mountainside monasteries and isolated forests, Gates joins renowned researchers, historians, mountaineers and local experts as he tracks Yeti sightings in hopes of finding the mysterious creature. Want more Yeti? Head to TravelChannel.com for “Expedition Unknown: Hunt for the Yeti” show extras including behind-the-scenes photos, Yeti facts, on-location videos and travel tips from Josh Gates. Follow @TravelChannel and #ExpeditionUnknown for more exclusive content and updates. Follow host Josh Gates on Twitter: @joshuagates and on Instagram: @gatesygram. What do you think? How do you like the sound of the Expedition Unknown: Hunt for the Yeti TV show? Do you plan to catch the premiere on Travel Channel? More about: Expedition Unknown: Hunt for the Yeti, Expedition Unknown: Hunt for the Yeti: canceled or renewed?, Travel Channel TV shows: canceled or renewed?